I am 100% pro-life and pro-adoption, and yet I have learned so much from our own foster / adoptive experiences. It is not something to be entered into without a lot of information, information that I was incredibly ignorant of going into this process. The journey has been harder than anything I could have imagined at the beginning. Out of respect for the child, I don't think I'll ever be able to publicly share the full story of how we lost a foster-child a year ago after nearly three years of prayer, the best intentions and efforts. I belong to a Catholic Foster/Adoptive group on Facebook now that wasn't even in existence yet at the time that we were going through such hardship and heartache. They have been such a blessing to me and hearing their stories has helped the healing process. I am also thankful to those family and friends who stood by us as our world was falling apart and of course, I am thankful for the grace of God, without which we never would have made it. One of the members of that FB group shared this article: http://outofshemind.com/2015/01/dear-adoptive-parents-hard-lonely-road/ If you are parenting a child who has experienced trauma (and that pretty much includes ALL foster children, although not all act out in the same way) or if you are thinking about foster parenting, I encourage you to read it, not to scare you away from the road if that is what God is calling you to do, but so that you can better prepare yourself for the difficulty if it comes, and perhaps more importantly, know that you are not alone and that you are not a bad parent. And if you have a friend or family member who is struggling with a foster/adoptive child, I encourage you to read it as well. Please believe their stories and try to understand their pain. Their stories may seem out of the realm of possibility, but they aren't making it up. This is an excerpt from the reflection from Living Faith by Steve Givens for January 27, 2015. Time and faith have shown me over and over that our job is to be patient, to get up every day and pay attention, watching for directional signs and fellow travelers that God puts into our lives. Inherent in this idea of patience is the idea of trust. We have to trust that God is present in our lives, caring and moving and working in us and through us. God is there, pointing the way and whispering suggestions, if we are quiet and still enough to notice. Lord, help me be patient with you as you form my life. Do you want to incorporate more art into your family’s life? 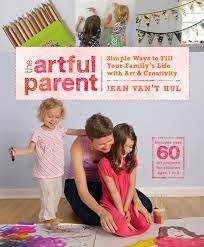 If the answer is yes, then “The Artful Parent: Simple Ways to Full Your Family’s Life with Art & Creativity” by Jean Van’t Hul is definitely a book you will want to pick up. Van’t Hul is a graduate of Wellesley College with a major in art history and studio art. A mother of two, she has been writing about children’s art and creativity since 2008 on her blog The Artful Parent. Van’t Hul includes sections on how to make time for art in a busy life, store art supplies, contain the mess, encourage children who aren’t interested in art, and ideas for storing and displaying finished projects. In addition, over sixty art projects for children are included and depicted in full-color photographs with easy-to-follow directions. I’ve already tried some of these projects with my own children and they have enjoyed them immensely. Also, while the book states it is for children ages 1-8, older children, teens, and even adults will definitely enjoy many of these projects as well. Because they are about process, rather than product, each individual can use his or her own particular skill level in working on the artistic endeavor. “The Artful Parent” is a creative treasure, perfect for any parent or educator who wants to bring more art into children’s lives. January 22nd is the day for the Annual March for Life in Washington, Please support their efforts in prayer. Here is a Novena to Three American Saints for Life from the USCCB. Saints Elizabeth Seton, Frances Cabrini and John Neumann are powerful witnesses to the Gospel of life, each in their own time. This novena suggests three days of prayer to each of the Saints for the promotion of Life in our country and our Church today. Saint Elizabeth Ann Bayley Seton, a prominent New York aristocrat, had five children with her husband, William, a shipping merchant. Before she turned 30, the Setons went bankrupt and William died. Within five years of his death, Elizabeth had converted to Catholicism, formed New York city’s first charity (the Society for the Relief of Poor Widows with Small Children), established the first Catholic school and the founded the first religious community of women in the United States of America. Saint John Nepimucene Neumann came to the United States as one of 36 priests to serve the 200,000 Catholics of New York and New Jersey in 1836. As a priest in Buffalo, Pittsburgh, and Baltimore, and as Bishop of Philadelphia, he was tireless in his love for the people of the United States. He died in 1860, while on his way to mail a chalice to a missionary priest. Frances Cabrini was born in a little village in Lombardy in 1850, so fragile at birth that she was brought immediately to Church to be baptized. While from her youth she dreamed only of being a missionary, she was three times rejected when applying to a convent. Yet in her years of religious life she founded an order, 70 orphanages, schools and hospitals, scattered over eight countries in Europe North, South, and Central America. Inspire doctors to be apostles for life. Teach us that all life comes from God and rests only in him. Be with the child who is alone or afraid. Jill Mullin has a clinical background in Applied Behavior Analysis and many years of experience working with individuals on the autism spectrum. What she would like people to understand, especially those who don't have any first-hand experience of autism, is just how broad that spectrum is. 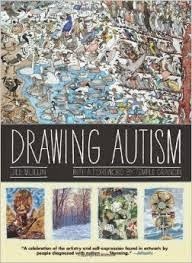 In "Drawing Autism" she endeavors to display art from individuals at all different levels of that spectrum who enjoy expressing themselves via art. She asked each selected artist to complete a questionnaire about his or her art, including why the person began making art, what is exciting about art, how subjects are chosen, and whether art helps others understand one's view of the world. Some were able to answer independently, others needed help with reading or writing; others were completely nonverbal and unable to reply. Both the art and the responses offer an interesting glimpse into the autistic brain, and illustrate that art can often be an expressive medium for those who lack the ability to communicate in other ways. Mary was not only the mother of Jesus. She was also a housewife. The utensils she holds are earthy and heavenly symbols. The Keys: to keep house and home safe. They are also keys to open the door to heaven. The Kettle: to nourish your body and soul. The Broom: cleanliness in your home, also your thoughts and deeds. 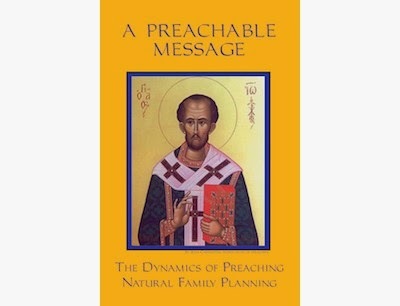 When was the last time you heard a priest give a homily that mentioned Natural Family Planning? If you are like me, the answer is never. Admittedly, it isn’t necessarily a topic that I would want discussed at a Mass where younger children are present, but there are many times when it would be appropriate, such as at Masses on college campuses or on retreats or in marriage preparation programs. Yet all too often, priests fear bringing the topic up. They know it is a difficult subject for many and so they avoid it with a ten-foot pole. The book also includes homilies that various priests have given which include a discussion of NFP, and Prayers of the Faithful that include mention of contraception as well as cover the full range of sexual issues and sins. The last section features Scriptural texts in the liturgical year that can be used as a jumping off point to discuss NFP. There is also a prayer for the conversion of those who have practiced contraception. This book should be in the personal library of every Catholic priest and deacon. The updated edition of this book can be purchased at http://www.boma-usa.org/preachable.php. Anyone searching for a teacher of NFP can visit http://www.boma-usa.org/teachers.php to find one near them. If you happen to live in the Greater Springfield, MA area, my friend Jennifer McManus is a certified teacher. She can be reached at mcmanus57 at comcast.net.